Abuja, Nigeria. 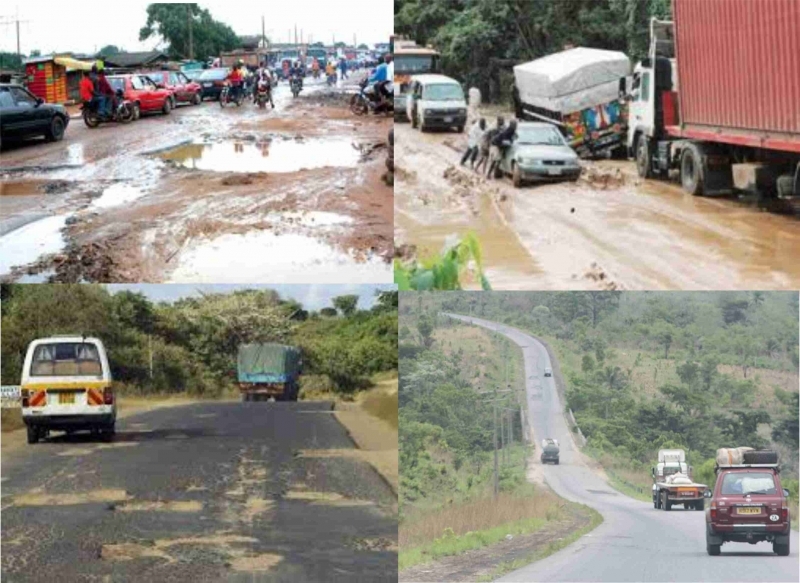 May 14, 2013 - Latest weekly poll results released by NOI Polls have revealed that the majority of Nigerians (82%) believe that Bad Roads, followed by reckless driving, are mainly responsible for the spate of road accidents in the country. In addition, Nigerians are of the opinion that it is the responsibility of the Government to make the roads safer. These were two key findings from the poll on the Safety of Nigerian Roads conducted in the week of May 6th 2013. In a recent statement to mark the 2013 Global Road Safety Week, the UN Secretary General, Ban Ki Moon, announced that about 1.3 Million people die in road accidents each year, with as many as 50 million people sustaining injuries. It has also been estimated that over 80 percent of reported cases occur in developing countries, with African countries recording the highest deaths, and Nigeria placed amongst countries with the highest number of deaths. Road accidents have become a regular phenomenon in Nigeria. In 2011, the Corp Marshal of the Federal Road Safety Corps (FRSC), Mr Osita Chidoka, stated at a conference of the Institute of Safety Professionals that “Nigeria is currently 191st out of 192 countries of the world’s ‘unsafe’ roads”. Similarly, the FRSC reported that in the first half of 2012, 1,936 people were killed through road accidents in Nigeria. More recently, there have been media reports of severe road accidents which have resulted in serious injuries and claimed several lives, such as the reported loss of about 110 lives from multiple accidents on the Benin–Ore and Onitsha-Owerri express roads in April 2013, and the Damaturu–Gashua road accident which also killed 20 people. This recent spate of road accidents is very worrisome and requires concerted efforts. More so, the untold pain accidents bring to families, friends and relatives cannot be over emphasised. Clearly, there is need for drastic measures to stem the tide of road accidents and make Nigerian roads safer. Against this background and the recent Global Road Safety Week (6th-12th May 2013), NOI Polls conducted its recent poll on the safety of Nigerian roads. It is expected that the results & findings of this poll will beam the searchlight on the perception of Nigerians regarding road accidents and stimulate the much needed commentary in the social space to provide viable solutions. Respondents were asked five specific questions. The first question sought to establish the perception of Nigerians regarding the safety of roads? Respondents were asked: In your opinion, how safe are the roads in Nigeria? Overall, majority of the respondents (71% in total) are of the opinion that the roads in Nigeria are unsafe; with 58% who think the roads are “somewhat unsafe” and 13% who think they are “very unsafe’’. 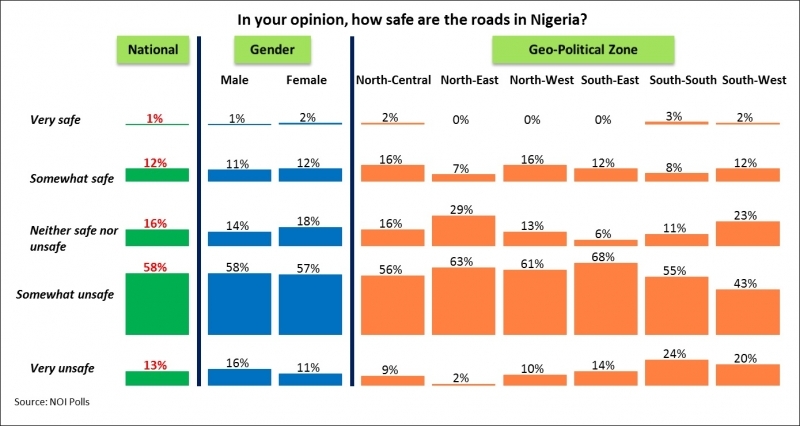 On the other hand, only 13% in total think the roads in Nigeria are safe; with 12% who think they are ‘’somewhat safe’’, while only 1% think they are ‘’very safe’’. Furthermore, 16% are neutral and think Nigerian roads are ‘neither safe nor unsafe’. However, when the results are analyzed in more detail, some interesting facts emerge. The South-East region has the highest proportion of people that think roads are unsafe (82% in total), followed by the South-South (79% in total). 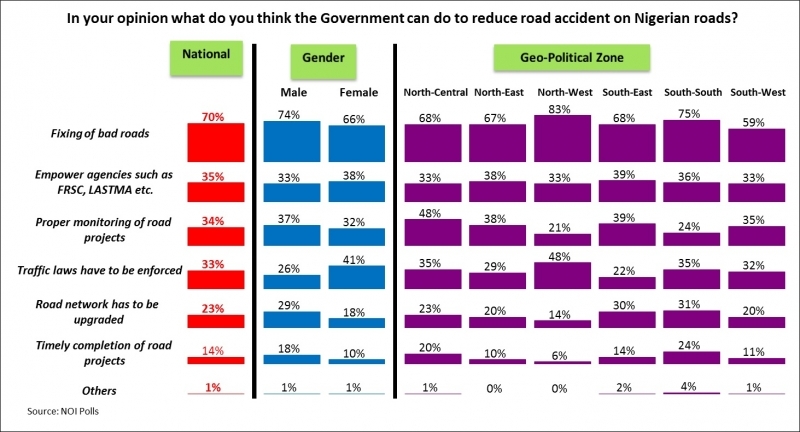 On the other hand, the North-Central has the highest proportion of respondents who think the roads are safe (18% in total), followed by the North-West (16% in total). 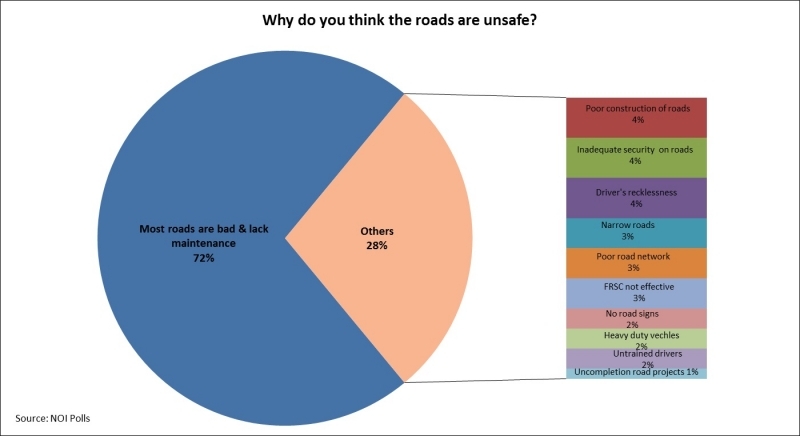 Respondents were then asked the follow-up question: Why do you think roads are safe or unsafe?Respondents who indicated that Nigerian roads are safe (13% of the total) gave their opinions regarding why they think Nigerian roads are safe. 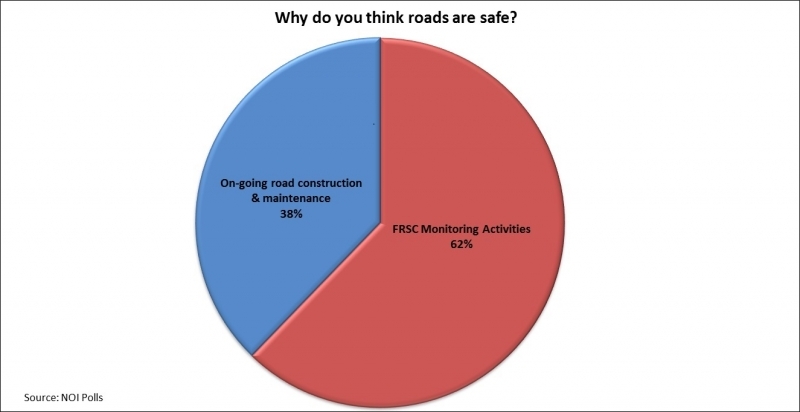 The most popular reason (62%) given is that “FRSC is engaging in effective monitoring of the roads”, followed by 38% who are of the opinion that “there are on-going construction and maintenance works on some roads and they are improving”. For respondents who are of the opinion that roads in Nigerian are unsafe (71% of the total sample), the majority (72%) simply said “Most roads are bad and they lack maintenance”. Other reasons mentioned include “Bad materials or poor construction of roads”, “Drivers’ recklessness”, “poor road networks or no road signs or heavy duty vehicles”, “Inadequate security on roads or armed robbers” and “untrained drivers or uncompleted projects” amongst others. Moving forward, in order to assess the opinions of Nigerians regarding possible cause(s) of road accidents; respondents were asked: What do you think is mainly responsible for road accidents in Nigeria? To this question, respondents were encouraged to list several possible causes. The results show that majority of respondents (82%) think “Bad roads” is the leading cause of road accident in Nigeria, followed by “Drivers recklessness” (73%). Other possible reasons mentioned are “Drivers don’t go to driving school” (19%), “Drunk Driving” (18%), “Vehicles are not road worthy” (14%) and “No road signs” (5%). This finding indicating that “Bad roads” is the main cause of road accidents corroborates previous findings which suggested that Nigeria ranks high in the list of countries with unsafe roads. Consequently, respondents were asked: In your opinion which one of the following should be mainly responsible for reducing the number of road accidents in Nigeria? 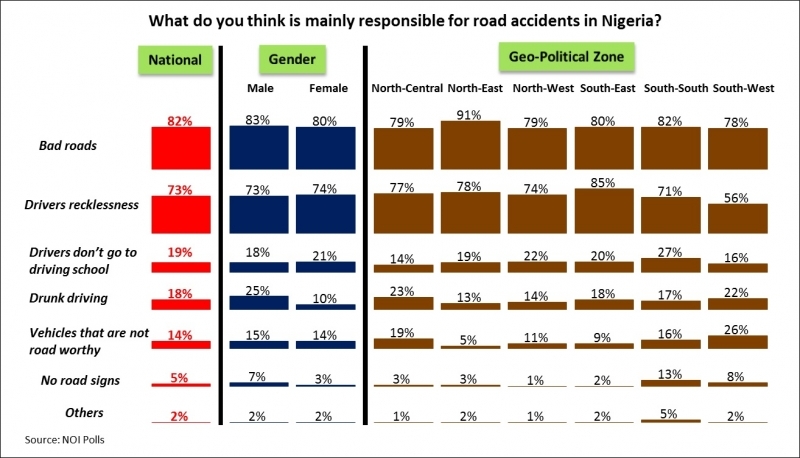 The majority (49%) think the Government at Federal, State and Local levels should be mainly responsible for reducing the number of road accidents in Nigeria. However, this is followed by a significant proportion of respondents (36%) who believe “Actual Road users” ought to bear the responsibility for reducing the number of road accidents. Furthermore, 14% think it is the responsibility of government agencies such as FRSC, VIO and LASTMA, while 2% think everyone is responsible. Looking across the geo-political zones, the North-Central has the highest proportion of respondents (58%) that think the government should be responsible for reducing road accidents, while the North-East has the highest proportion (40%) that think it is the responsibility of actual road users, and the South-West has the highest proportion of people (22%) who think government agencies ought to be responsible. Finally, respondents were asked the following question: In your opinion what do you think the Government can do to reduce road accident on Nigerian roads? The majority of Nigerians (70%) think that the Government should”Fix bad roads” in order to reduce the road accidents in Nigeria. This is followed by 35% who think that the government should “Empower government agencies such as FRSC, LASTMA etc”, 34% who think it’s about “Proper monitoring of road projects” and 33% said that “Traffic laws have to be enforced”. Other suggestions include “Road network has to be upgraded” (23%) and “Timely completion of road projects” (14%). In conclusion, the results indicate that the majority of Nigerians think that Bad Roads are mainly responsible for the recent spate of road accidents, followed by Driver’s recklessness or haste. In addition, other important areas have been identified such as untrained drivers, drunk driving and vehicles that are not road worthy. In this regard, majority of the respondents believe it is the responsibility of Government at various levels – Federal, State and LGA – to fix the roads and make them safer. Finally, we suggest that in addition to fixing the roads, government agencies such as the FRSC should be empowered and funded to do more.